The Tiger Woods of Tennis? You may not have ever heard of little Eldrick back in 1981 when he first appeared in an issue of Golf Digest — but you sure know him now: Tiger Woods, one of the most successful golfers of all time. 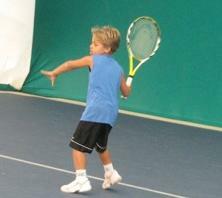 This weekend, as the tennis world is watching the French Open, we’re going to tip you to a pint-sized tennis prodigy. It’s 6-year-old Jan Silva of California. He’s there in the stands at the French Open this weekend. But who knows, in a decade or so he might be there on the courts. Rene Gutel has his story. Listen here. This story was reported for Weekend America.